Who says a watch cannot be a romantic Valentine’s Day gift? Flowers, chocolates, and diamonds can sometimes be overrated. So why not up your game and indulge her with a luxury watch? If you really want to make an impression, however, tailor your gift to her interests and personality. From classic two-hand watches to skeleton dials and chronographs, you can’t go wrong with a thoughtful, personal timepiece that’s an expression of your love. 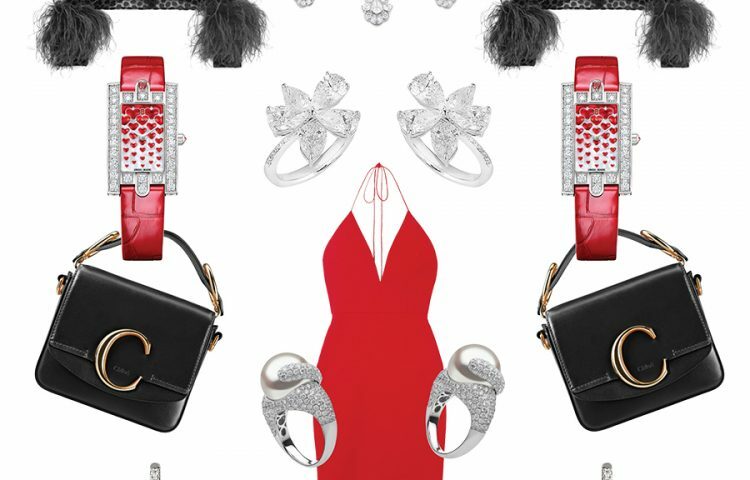 To help you surprise her on Valentine’s Day, we’ve picked out seven timeless timepieces that would put a smile on her face. 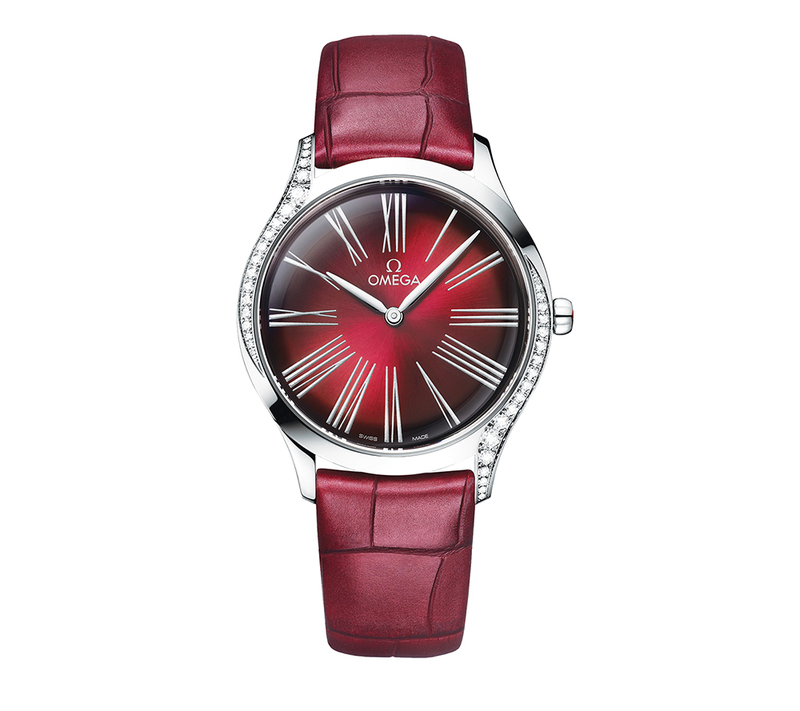 Complement your bouquet of red roses with the Omega De Ville Tresor timepiece. It comes in a distinctive shade of red — garnet — on the dial and leather strap that aims to set her heart racing. The elegant 36mm watch features diamonds alongside the case and a single diamond set within the crown, which is also adorned with a flower created out of five Omega logos in red liquid ceramic. The caseback is as seductive as the front, with a polished, mirror effect and “Her Time” pattern. She’s sporty yet still a girly girl at heart. She loves being active as much as she loves dinner parties and cocktails. A timepiece like the Blancpain Chronographe Flyback Grande Date does double duty by having a chronograph complication without resorting to the masculine profile of a typical sports watch. It is also an elegant and feminine timepiece with an off-centred time display at 12 o’clock and chronograph subdials at 3 and 9 o’clock. It features a 38.6mm diamond-set red gold case with mother-of-pearl dial, large date at 6 o’clock, and a white ostrich strap. The self‑winding Calibre 26F8G with 40 hours of power reserve can be admired through the sapphire caseback. The sky’s the limit, and she’s not afraid to work towards her goals. 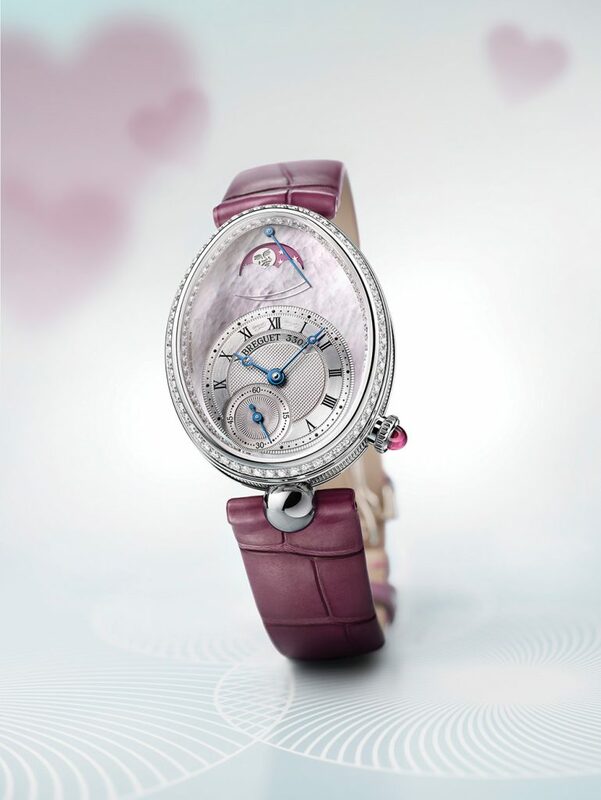 This makes Breguet’s latest Reine de Naples a perfect statement-making timepiece for her. 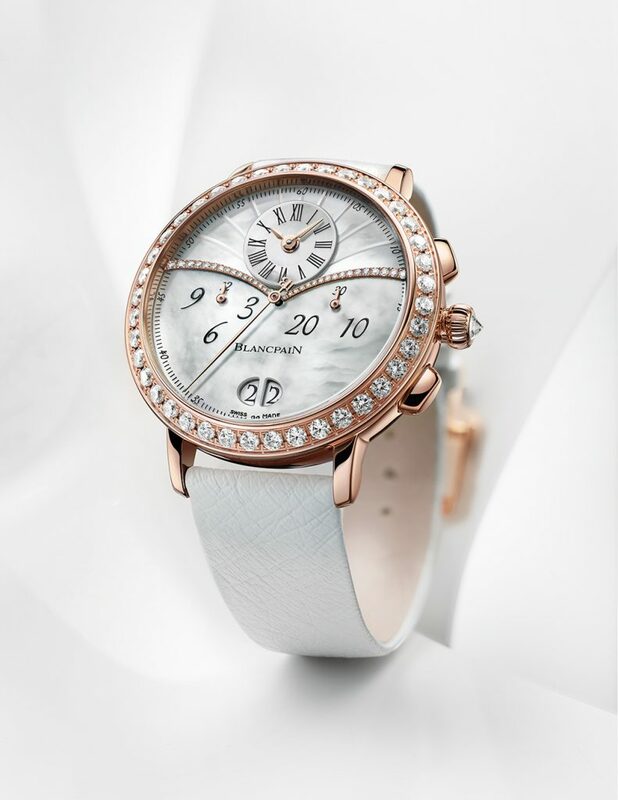 From a collection that pays homage to the wristwatch Abraham-Louis Breguet made for Caroline Murat, Queen of Naples, in 1812 (the first known wristwatch in the world), this timepiece is adorned with beautiful shades of pink and mauve, white gold and diamonds. The dial is an iridescent pale pink mother-of-pearl, featuring a moon phase indicator against a deeper pink sky, small off-centre seconds and hour chapter with Roman numerals. It ticks to the beat of the 537DRL2 self-winding manufacture movement, with 45 hours of power reserve. 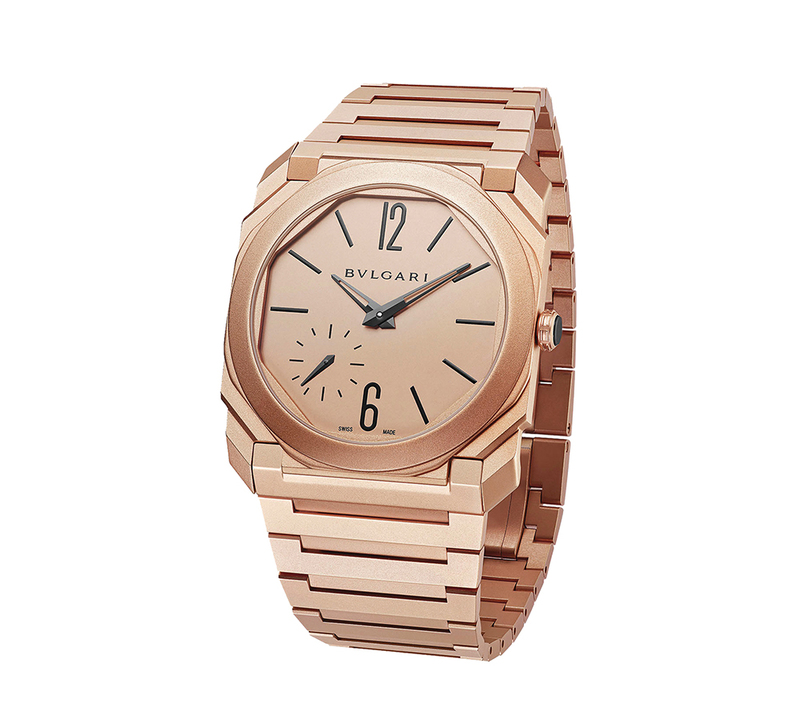 The Bvlgari Octo Finissimo Automatic watch would make a unique gift. It was once the thinnest automatic watch in the market (the movement measures just 2.23mm in height) and previously available in titanium. The 2018 model comes in steel and 18K pink gold. The sandblasted case, bracelet, and dial are given a matte finishing that lends an unusual, bold yet understated look to the timepiece. The ultra-thin Calibre BLV138, manufactured in-house, powers the hour and minute hands, and small seconds. It can be admired through the caseback, and offers a 60-hour power reserve. Diamonds are her best friend. The Hublot Big Bang Tourbillon Croco high jewellery watch is not for the faint of heart. The 45mm white gold timepiece has 380 baguette diamonds that are cut and arranged to look like scales in a layout carefully designed to recreate the pattern of crocodile skin. 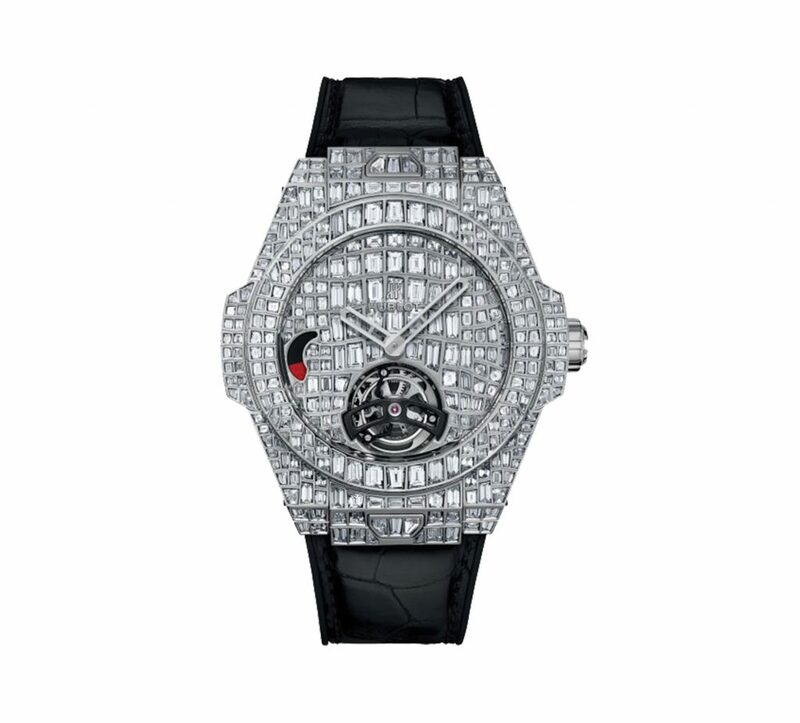 The dial alone is set with 102 baguette diamonds totalling 4.3cts. The tourbillon at 6 o’clock gives the wearer a glimpse of the self-winding movement, the Calibre Hublot HUB6016, with a power reserve of 115 hours. If this is not enough, the timepiece comes paired with its own bullet-resistant crocodile leather jacket, which has a unique high-tech lining that enables the jacket to withstand and absorb the impact of powerful projectiles. 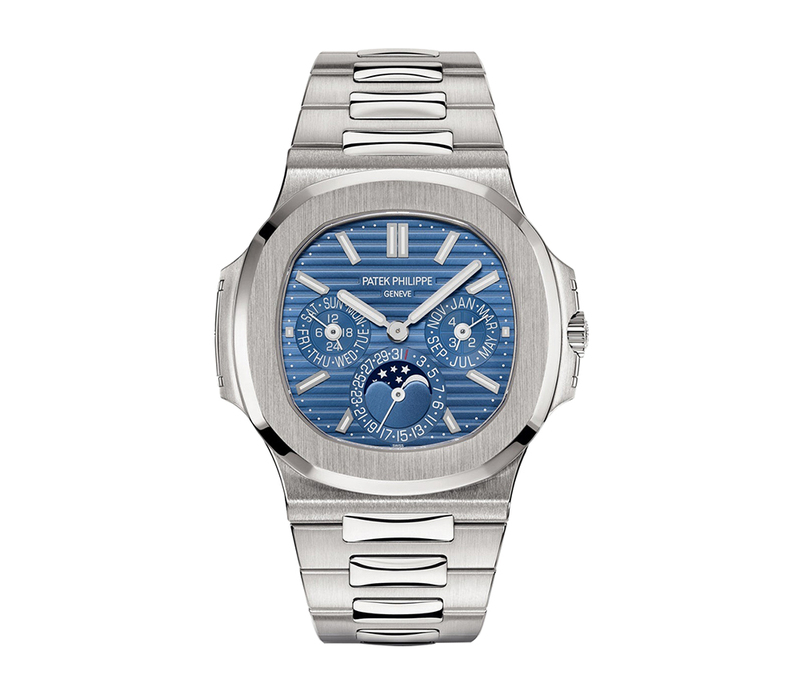 Patek Philippe’s iconic Nautilus became one of the brand’s most popular collections when it was introduced in 1976. For ladies with busy schedules, its latest model, Ref 5740/1G, would make the Nautilus even more sought-after now that it comes with a perpetual calendar. The white gold timepiece measures 40mm across and features the month, day, date, leap year, moon phase, and 24-hour cycle. Despite having a relatively slim automatic movement, Calibre 240Q, it maintains its classic features: a blue dial with horizontal ribbing, luminous applied markers and hands, and the mix of brushed and polished finishes. Chopard’s limited edition L.U.C XP Esprit de Fleurier Peony is an elegant and graceful timepiece that features fragile peony flowers on the dial. 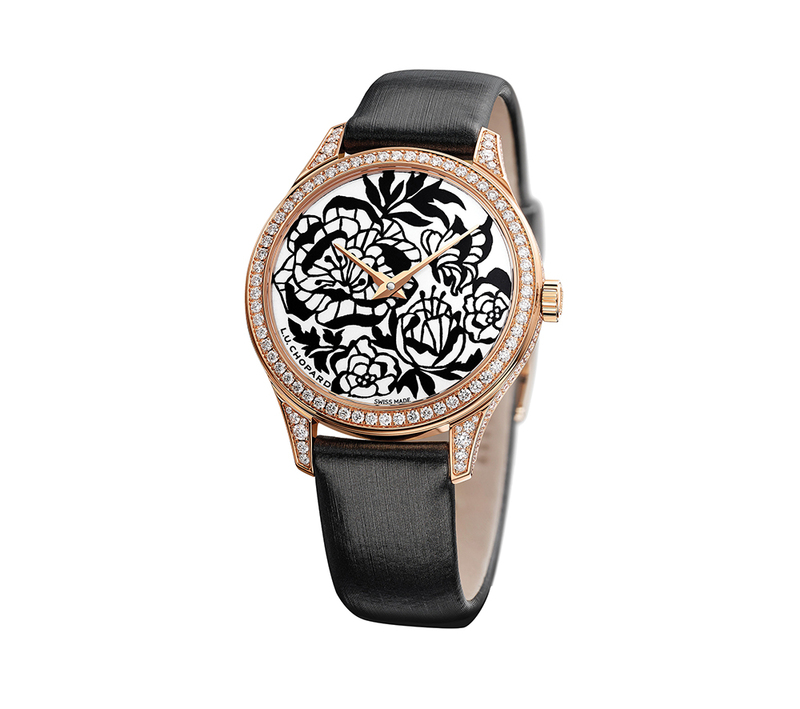 Using the traditional Swiss technique of paper cutting, the black florals are contrasted against a white Grand Feu enamel dial for a strong, bold presence that is offset by diamonds on the bezel and lugs. The 35mm 18K rose gold case houses a self-winding in-house movement L.U.C 96.23-L2 that is hand-engraved with the Fleurisanne technique. A matching black fabric strap completes the look. She’s the one who fixes the WiFi when it’s down. 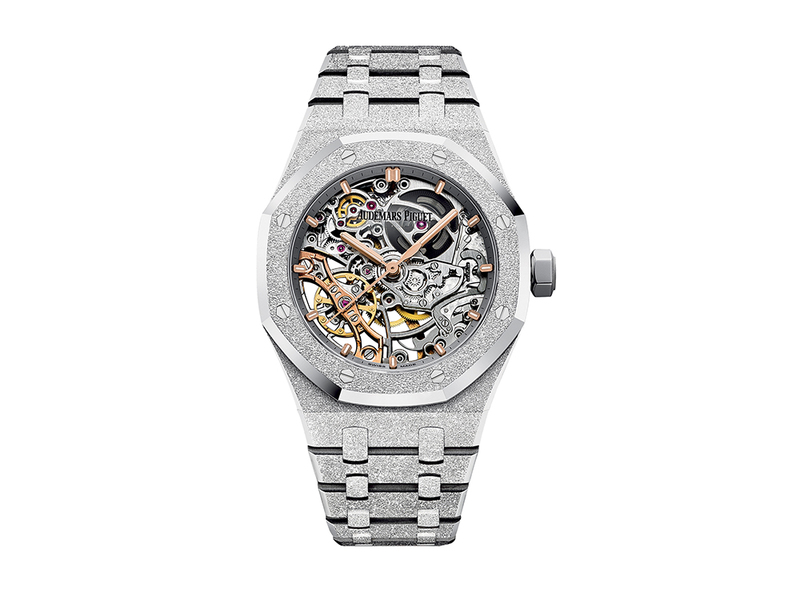 The Audemars Piguet Royal Oak Double Balance Wheel Openworked timepiece features one of the most technically advanced calibres in a 37mm size — perfect for slim wrists. The skeleton design allows the wearer (and everyone else nearby) to admire the new self-winding Calibre 3132 that features two balance wheels and balance springs, said to improve stability and precision. Housing the finely decorated movement is a white frosted gold case, hand-hammered using an ancient Florentine technique to give a shimmering look. The bracelet also features the same treatment. High Fashion is her thing. If she always looks on-point in the latest fashion trends, then the Chanel Boy.Friend Skeleton Calibre 3 would be ideal for her. It will easily take her from boardrooms to ballrooms – its in-house movement blends stylishly with the rectangular beige gold case. The skeleton bridges form three overlapping circles that have been, along with the wheels, treated with matte black ADLC. Other than pops of gold and ruby, the watch’s minimalist aesthetic echoes a cool Parisian vibe that’s equal parts androgynous and sophisticated. The manually wound movement offers a simple hours and minutes with small seconds, displayed by beige-gold coloured hands.